5.3:1 retrieve makes the Daiwa Exceler-HA Spinning Reel a great all-around choice for a variety of different techniques. 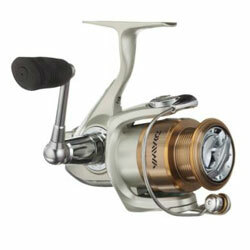 Exceler-HA Spinning Reel features ABS aluminum spool, DigiGear gearing, three CRBB ball bearings plus Infinite Anti-Reverse, Advanced Locomotive Levelwind, TwistBuster, and precision click-adjustable drag. "Like it alot great drag and awesome retrieval speed, but just whish it would return to center for easier casting"